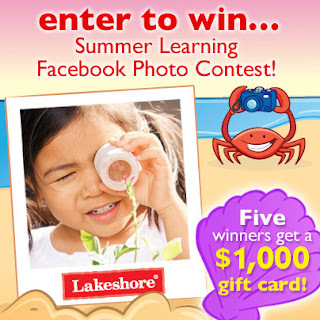 Have you entered Lakeshore's Summer Learning Facebook Photo contest? I LOVE Lakeshore products. I have used them in my classroom for more than 10 years. Their products are high quality and meet the standards. I love that my students think they are playing games, when in fact they are truly learning. - Click on the Entry form and submit a picture of your child participating in their favorite summer learning activity! From a visit to the local zoo, to nature walks to fun family road trips and everything in between! - The top photos with the most ‘Likes’ --WIN! - Winners: 5 lucky fans will be awarded with a $1,000 e-gift card! PLUS everyone who enters will receive a special discount coupon as a thank you for their participation. DISCLAIMER: I did not receive any compensation for promoting this contest. I truly believe in their products. In fact- my classroom has been referred to as the Lakeshore mini-mall.